Home Styles Biscayne 5-Piece Set includes 48-inch Round Outdoor Dining Table and Four Arm Chairs. Set is constructed of cast aluminum with a White Finish. Features include powder coat finish sealed with a clear coat to protect finish, attractively patterned table top has center opening to accommodate umbrellas, and nylon glides on all legs. 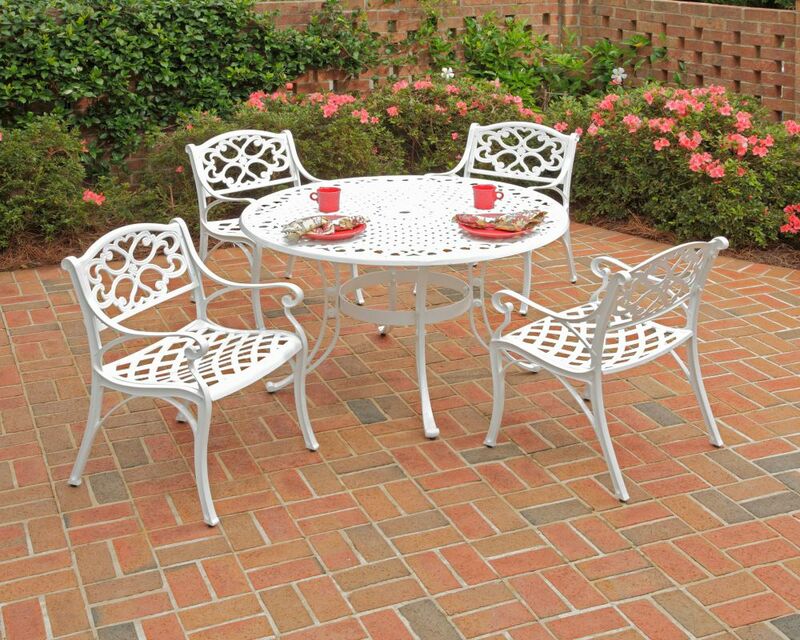 Biscayne 5-Piece Patio Dining Set with 48-inch White Table and Four Arm Chairs Home Styles Biscayne 5-Piece Set includes 48-inch Round Outdoor Dining Table and Four Arm Chairs. Set is constructed of cast aluminum with a White Finish. Features include powder coat finish sealed with a clear coat to protect finish, attractively patterned table top has center opening to accommodate umbrellas, and nylon glides on all legs. Biscayne 5-Piece Patio Dining Set with 48-inch White Table and Four Arm Chairs is rated 2.0 out of 5 by 1. Rated 2 out of 5 by willsy from So far, so good For the price, the product appears to be well designed, and consequently was easy to assemble. It is too early to comment on how well the patio furniture will age and hold up as I purchased only a month ago.